Born: 11 October 1875, King William's Town or Grahamstown, South Africa. Died: 19 April 1942, Pretoria, South Africa. 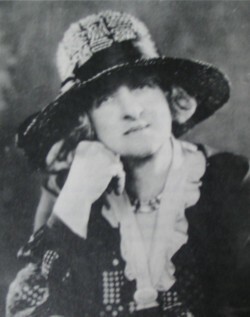 Sydney M. Stent, daughter of the architect and engineer Sydney Stent, was educated at Bedford College for Women, London. In September 1904 she was appointed as technical assistant to Joseph Burtt Davy* in the Division of Botany, Department of Agriculture of the Transvaal Colony, to take care of the newly established herbarium in Pretoria. Her duties consisted mainly of treating plant specimens with poison against insects, label and mount them, and sort them into their cases. Later she was put in charge of the economic and seed section. As co-author with Burtt Davy she contributed three notes to the Transvaal Agricultural Journal: "Notes on the determination of plants of economic interest" (1908/9), and "Notes from the Economic Herbarium" (in two parts, 1908/9 and 1909/10). A few years later she contributed "Botanical notes" to the Agricultural Journal of the Union of South Africa (1913, Vol. 6). In due course Stent became a competent self-taught botanist. A number of articles by her were published in the Journal and Bulletins of the Department of Agriculture, for example, on Rhodes grass (1921, with H.A. Melle), Star grass (1921, with H.A. Melle), Poisonous properties of Sudan grass (1922), Dubbeltjie and geeldikkop in sheep (1922), Poisonous plants of South Africa (1922 and 1929, with H.H. Curson*), and Natal grass (1923). In subsequent years she described various new species in the journal Bothalia: "South African Gramineae" (in four parts, 1923-1928), "An undescribed geocarpic plant from South Africa (Cucumis humofructus)" (1927), "An undescribed species of Schmidtia" (1928), and "Some new species of Digitaria" (1930). Both her own articles and many others written by Burtt Davy were illustrated by her line drawings. Grasses became her main interest and in 1922 she was given the title of Agrostologist in the Division of Botany and Plant Pathology of the Department of Agriculture of the Union of South Africa. That same year she made an extensive collection of grasses at Henley on Klip, near Vereeniging. At the annual congress of the South African Association for the Advancement of Science in 1915 Stent read "Notes on some of the South African Stapeliae", but the paper was not published. In 1916 she became a foundation member of the South African Biological Society. According to a local newspaper report she cast her vote in the General Election of 1920, becoming the first woman to do so in South Africa, as women did not yet have voting rights. Her masculine-sounding name had been put on the voters' list by mistake! She was a member of the Transvaal Philosophical Society and a keen amateur actress and artist. Stent retired on pension in October 1930, at the age of 55. She then moved to Salisbury (now Harare) in Southern Rhodesia (now Zimbabwe) to take up an appointment in the Department of Agriculture. There she continued her work on grasses until 1934, when she settled in Pretoria. In 1933 she and J.M. Rattray published an extensive paper on "The grasses of Southern Rhodesia" in the Proceedings of the Rhodesia Scientific Association (Vol. 32, pp. 1-64). The species Ceropegia stentiae and Digitaria stentiana were named after her. Agricultural Journal (Union of South Africa), 1913, Vol. 6. Bothalia, 1923-1930, Vol. 1-2, papers by Stent. Fourie, D. The history of the Botanical Research Institute, 1902-1989. Bothalia, 1998, Vol. 28(2), pp. 271-297. Gilliland, H.B. On the history of plant study upon the Witwatersrand. Journal of South African Botany, 1953, Vol. 19, pp. 93-104. National Archives Repository (TAB), Source MHG, Vol. 0, Ref. 1775/42: death notice, Sydney Margaret Stent. Transvaal Agricultural Journal, 1908-1910, Vol. 7 and 8. Women of South Africa. Cape Town, 1913.